Our special air management system removes moist air from the lowest part of your crawl space and exhausts it to the outside, preventing it from being drawn upward by the stack effect. This adjustable system can lower the humidity in your crawl space and your living area to 40% or less. Excess humidity causes breathing problems, mold growth, and supports the growth of dust mites. High humidity causes damage to furnishings, furniture and wood floors. Dust Mites thrive in our homes in Portland. The average relative humidity here is about 75% to 80%. Mold stops growing when the relative humidity falls below 70%. The majority of moisture supporting mold growth originates in your crawl space. Radon gas is odorless and colorless. It is released naturally in soils, and the amounts present in your home vary, depending on your location, home design, and ventilation. Ventilating the crawl space properly will reduce the amount of radon that enters your living space. Pollen is pulled into a crawlspace through the open foundation vents and gaps at the foundation. This allergen is transported directly into your living area by the Stack Effect. Volatile Organic Compounds like formaldehyde and methane are released naturally by building materials and the ground itself. Petrochemicals are present in much of our ground water and can be found in our crawl spaces. 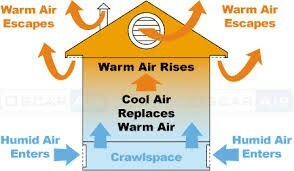 Preventing outside air from entering the crawl space will reduce heating costs by fourteen percent, on average.